CyberLink is bringing its suite of artificial intelligence-based video effects directly to Adobe users as a plug-in for Premiere Pro. Previously available only for CyberLink’s own PowerDirector editing software, the A.I. Style video plug-in uses algorithms trained on a neural network to “redraw” video footage in the styles of various artists, including Impressionists like Vincent van Gogh, as well as traditional Chinese painters. A.I. Style transfers are inherently different from traditional effects filters, which simply apply an effect over the source video footage. CyberLink’s plug-in will actually redraw the video in an artistic style, complete with brush strokes, using the source video only as a reference. It’s a bit like fully automatic rotoscoping, and has the potential to save animators many hours of time. It is limited, however, to the available styles, and adding new styles requires training the A.I. on a new data set at the server level. That is to say, you can’t automate your own artistic style — at least, not yet. 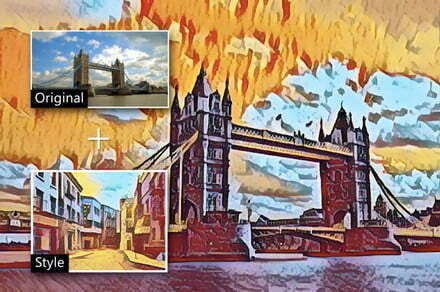 This technique is similar to what we’ve seen in apps like Prisma, but CyberLink’s technology is targeting a higher-end user and can output up to 4K resolution. The plug-in uses a pretrained A.I. that will run locally on a user’s computer, forgoing the need for an internet connection. This also means no data needs to be sent to a server to be processed,which both speeds up the workflow and offers some peace of mind for security-conscious editors. The plug-in requires an Nvidia graphics card compatible with CUDA 3.0 or later. As a Premiere Pro plug-in, CyberLink can put its tools into the hands of a very large group of video editors — but it also may run head-on into competition with Adobe, which is working on many of its own style transfer techniques using its Sensei A.I. platform. CyberLink currently offers four style packs: The Van Gogh pack, two packs of Impressionists styles, and the traditional Chinese painting pack. Each pack contains nine to 10 unique effects, but they don’t exactly come cheap: Each pack costs $150. The plug-in is also only compatible with the Windows version of Premiere Pro CC 2017 and newer; MacOS users, at least for now, are left out.